July 28, 2016 - "Press Releases"
AMETEK has made major capital investments in the New Hampshire Haydon Kerk facilities, equipment and products - to ensure robust quality and dependable on time deliveries. 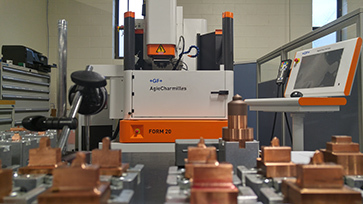 Investments at Haydon Kerk Motion Solutions include full migration to a unified and expanded KERK facility in Milford, New Hampshire; expansion of tool and molding capabilities; new capital equipment; and brand-new material requirements planning (MRP) software. So now, Kerk-brand motion products are available with the fast order fulfillment and precision engineering that Kerk customers expect. As a leading motion-control solutions provider, Haydon Kerk Motion Solutions sells high-performance modified acme leadscrew and anti-backlash-nut assemblies, stepper-motor linear actuators, and linear-rail and guide setups for laboratory automation, medical instrumentation, military, aerospace, semiconductor fabrication, and other industrial application. Kerk products provide myriad precision linear-motion solutions for such designs.